Former Yukon MLA Douglas Phillips has been named the territory's new commissioner. Doug Phillips, seen here with Prime Minister Stephen Harper, will be sworn in during the coming weeks. Former Yukon MLA Doug Phillips has been named the territory's new commissioner. 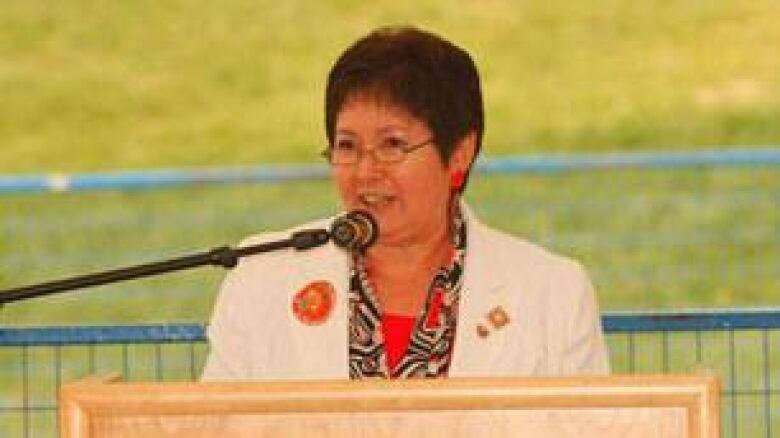 Prime Minister Stephen Harper announced on Tuesday Phillips would replace outgoing commissioner Geraldine Van Bibber. "Mr. Phillips brings a wealth of experience to this new position, having contributed to public and community service in Yukon for more than 30 years," Harper said in a written statement. Phillips has served as Yukon's administrator, or deputy commissioner, since 2007. He was the Riverdale North MLA from 1985 until 2000, during which time he served as a cabinet minister in John Ostashek's Yukon Party government. Phillips will be commissioner for five years. He is expected to be sworn in sometime in the coming weeks. According to the written statement, Phillips has also been actively involved in community service over the years, including wildlife conservation. Meanwhile, Van Bibber — who wrapped up her term on Tuesday — said representing the Yukon has been a wonderful experience. Outgoing commissioner Geraldine Van Bibber, seen in this file photo, said the position was very rewarding. (Courtesy of the Commissioner of Yukon) Van Bibber said she loved the pomp and ceremony of the position, including the officers from the RCMP and military who stood by her side at official events. "At first, it was startling," she said. "I remember … when I first came into office I asked them, 'What the heck do I do with you guys?' and now I just love it." Van Bibber said attending the annual Tea and Commissioner's Ball was fun, but giving out awards for bravery and community service was especially rewarding. "I get to see what Yukoners are doing, how they're involved," she said. "It's just opened my eyes to so many great things happening within our communities." The commissioner gave out commendations last week to those who helped her over the years, including a special thanks to Whitehorse Legion president Red Grossinger. He said her example led Legion members to make her their first ever honourary president. "Just her style, her personality, [she's a] down to earth, very honest person, and whenever she gives her word, it's guaranteed that things will happen." Van Bibber's only advice to her successor is to make the most of an extraordinary opportunity. "Good luck and enjoy every minute of it because it is such an interesting position and place to be," she said. "At the governor general's table, I said we are ordinary people in an extraordinary place, and it's what you make it." Territorial commissioners are appointed by the governor general on the advice of the Prime Minister and fulfill many of the same duties as the lieutenant governor of a province.